Today Latest Jobs in University of Swabi, (KPK) Jobs March 2019. Applications are being invited from “The University of Swabi” KPK Pakistan anticipates to appoint the well-disciplined, & knowledgeable applicants are required to apply for the Faculty Positions or regular basis / Tenure Track System at the university. University of Swabi Government of the KPK are Invited candidates for the Various posts of Professor, Professor Agriculture, Professor Agronomy, Professor Entomology, Professor Management Sciences, Professor Computer Sciences, Professor Law, Associate Professor, Associate Professor Horticulture, Associate Professor Plant Breeding, Assistant Professor, Assistant Professor English, Assistant Professor Urdu, Assistant Professor Sociology. Assistant Professor Journalism, Assistant Professor Mass Communication, Assistant Professor Economists, Assistant Professor Entomology, Assistant Professor Food Science, Assistant Professor Plant Technology, Lecturer. 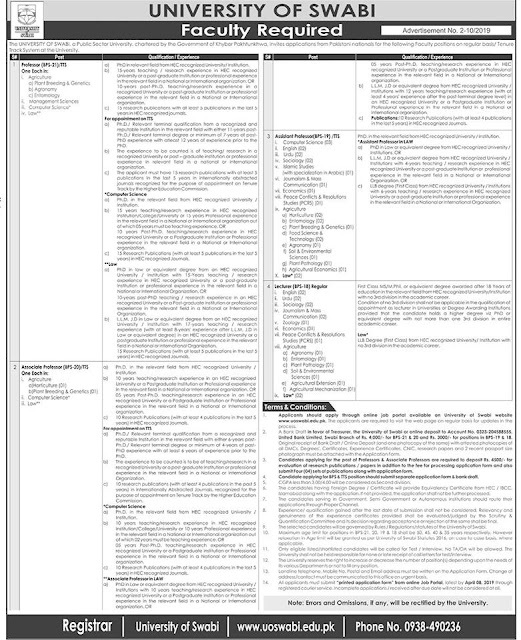 Get the job opportunity from Swabi University Jobs 2019 Application Form Download the Official websites of Swabi University KPK; www.uoswabi.edu.pk. All positions are on a regular basis as per the policy of the University of Swabi KPK, Pakistan. If you are unemployed yet & want to get a suitable job of government organization, then you should apply to these above mention posts. Now, I will let you know about its further information below. You must be 35 to 50 Years old to apply for these jobs. Applications can be downloaded from the university’s website at www.uoswabi.edu.pk. Applicants need to pay the Rs. 4000/ for BPS-21 & 20 and Rs. 3000/ for BPS-19 & 18 in UBL Bank in favor of Treasurer of the university. Application convoyed with paid bank draft & all attested copies of Academic documents, CNIC, Domicile and recent passport size photograph should reach at the specified address; Registrar, University of Swabi. The advertisement can be seen on the Official website; www.uoswabi.edu.pk.